Unbeknownst to us there was an â? ?extreme cold warningâ?? while we were traveling yesterday. Windchills dropped the temperature to 40 below. For our part, we actually managed to stay quite comfortable while skiing, if not even a little warm. Of course, there are always times during the day when the cold starts seeping in. We are working fairly hard skiing and pulling sleds so, while moving, our bodies generate a lot of heat. Consequently, we donâ? ?t wear a lot of clothes so as to not sweat while skiing as well. (Sweating is a dangerous adversary in this type of travel.) When we stop, however, we cool off very quickly and we have to don big down jackets at every break. The goal is to minimize the peaks and troughs of our body temperature and keep a steady equilibrium, but an extended break, a repair on a ski, extra time navigating means that we can quickly feel the cold seeping in- especially with a 40 below windchill. We skiied North directly into the wind then veered east to circle around the North end of Elk Island. Last year, we heard a wolf pack howling while camped near the southern shore. We wound in and around some smaller pressures slabs then set up camp. One of the unique aspects of this course is its focus on self reliance. 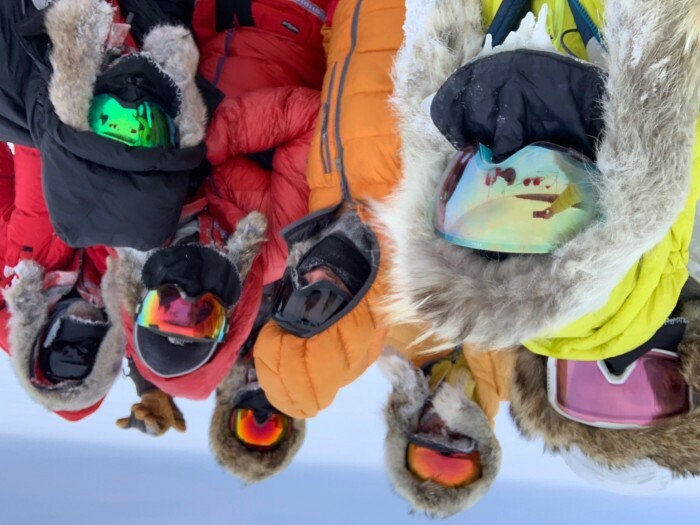 Just a week ago, this group of polar newbies had almost no winter camping experience. Today, we are safely and efficiently traveling and setting up camp in extremely dangerous conditions. In our â??otherâ?? lives there are so many layers that separate our actions from our well being. But here everything that we do has a direct consequence- positive or negative and it feels good to watch everyone slowly master these skills.